Brief Description: Are you a Notts County fan? Eager to impress family and friends with your knowledge of your favourite football club? Then look no further. The 800 challenging questions in this quiz book will give you the chance to prove how much you know. Dip inside the cover and test your memory of the matches, players, opponents, scores, transfers, honours, wins and losses that have shaped the history of The Magpies. A fitting tribute to the oldest professional football club and packed with information. 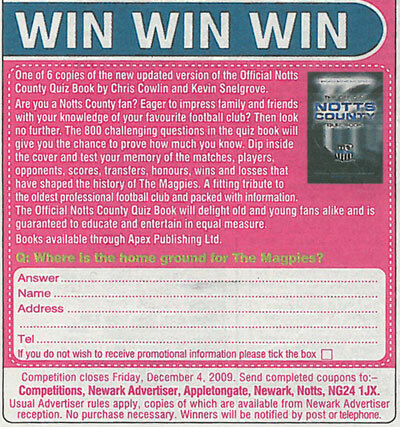 The Official Notts County Quiz Book will delight old and young fans alike and is guaranteed to educate and entertain in equal measure. 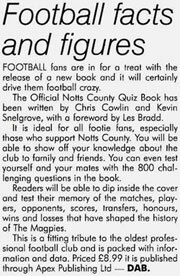 It has been a privilege to be asked to provide this foreword for the official Notts County quiz book which I believe will give Notts County fans many hours of pleasure in testing their knowledge about Football’s Oldest League Club. I joined the Magpies in October 1967 following a £1,000 transfer from Rotherham United for a period that was to last nearly eleven years and be the happiest of my football career. I consider myself very fortunate to be one of a group of young players that manager Billy Gray signed for the Club in a bid to build a team good enough to win promotion. Unfortunately, Billy was unable to deliver the results and he left the Club unable to see players such as David Needham, Brian Stubbs, Bob Worthington and Don Masson all players he had signed become legends in the Club’s history. Jimmy Sirrel arrived as manager in 1969 and the Club went on to win promotion three times over the next ten years and achieved first division status in 1980/81. It was a pleasure to be part of the success story in the early seventies as the Club climbed two divisions and when my goal scoring achievements earned me the accolade as the Club’s all time highest goal scorer. During this period we not only enjoyed promotions in the League but also great cup victories achieved against teams playing at higher levels. The Club also granted me a Testimonial year in 1977/78 and it was a year of many happy memories meeting supporters at darts nights, cabaret evenings and many other functions not least my testimonial game against Forest when over 11,000 fans attended the game for which I am extremely grateful. It was a sad day for me when I was asked to leave the Club at the end of the 1977/78 season having made 441 first team appearances and scored 137 goals. I was transferred to Stockport County for the fee of £15,000 and went on to play for the Club for three years before moving on to Wigan Athletic for a further two seasons. I retired from playing in 1983 having made a total of 614 appearances and scoring 205 goals. Following my retirement from playing football, I returned to Notts County to work in the Lottery Office and what a pleasure it was to be working for the Club whilst Neil Warnock was manager and the two occasions that he took the Club to Wembley to win successive promotions from the third to the first division. I have thoroughly enjoyed working in football for most of my lifetime and have recently completed forty two years in the business. 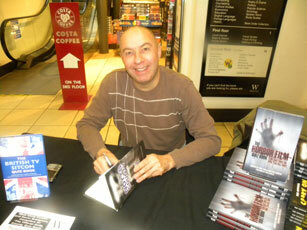 Nearly twenty five years have been spent at Notts County which I thought would help in answering questions in this book. I am sure like me you will enjoy the 1,000 questions that Chris Cowlin has compiled covering everything a County fan would wish for including great matches, managers, players, transfers, goal scorers, league positions and much more. I hope you have great fun with this book and remember for every sale of a copy of this book £1 will be donated to local Children’s charities and to Education for the Children, a charity close to the heart of our former player Tommy Johnson. A true test for all Notts County fans, fun for all the family. 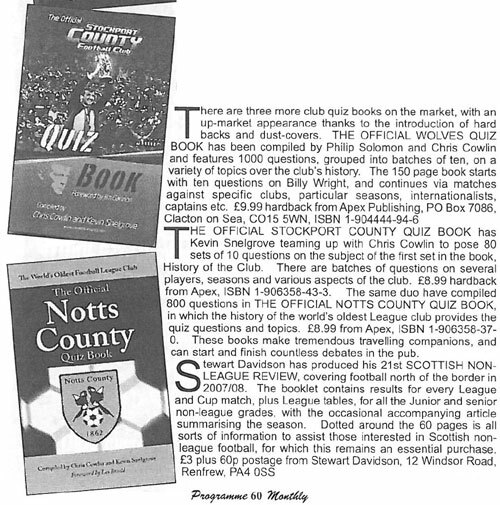 This quiz book will occupy the minds of anyone on a long trip and will thoroughly test County fans, both young and old, on their knowledge of the past happenings at the club. A wonderful set of questions, perfect for any Magpies fan. Have as much fun with this book as I did with Notts County. A book that every Magpies fan will not be able to put down. It’s a great book for everyone who enjoys football trivia. 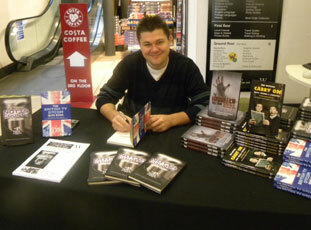 Definitely the book to have for a Notts County supporter or a fan of football history! 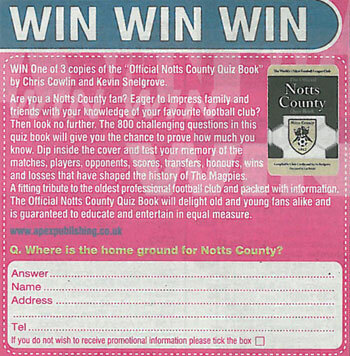 A great set of questions for any Notts County fan to try and tackle - I was certainly caught out on a few, this book will be great for down the pub and amongst friends - a must for any Magpies fan! What a great book, a perfect gift for any Notts County fan! This is the sort of book that will settle a few arguments - And probably starts a few more! An ideal present (stocking filler?) - For the stato Magpie! This book has so much information in that teaches you a lot about the history of Notts County – I am sure you will have a lot of fun with this! Essential for all Notts County fans! 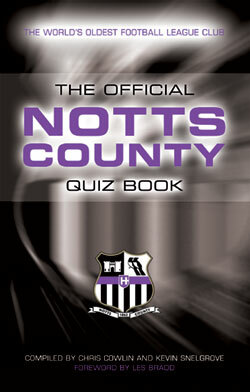 I really enjoyed The Official Notts County Football Club Quiz Book. It will test the memory of every Magpies fan! A book that every County fan will not be able to put down - an addictive read! This quiz book has it all, facts, figures and information about Notts County. I spent 14 years covering the fortunes of Notts County (1986-2000) for the Newark Advertiser, and although their results no longer make or break my weekend, the club will always have a place in my heart. 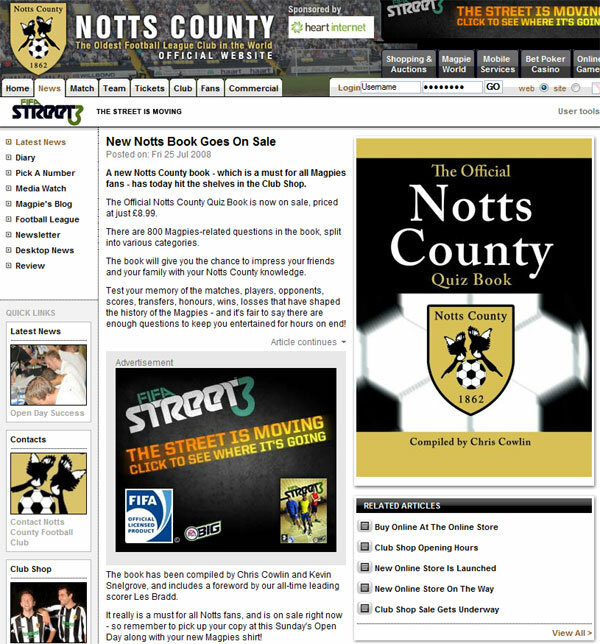 Notts fans have to rely on memories to keep them warm, and this book is just the ticket! 17 November 2009 - Chris Cowlin was interviewed on BBC Radio Nottingham 103.8 FM. 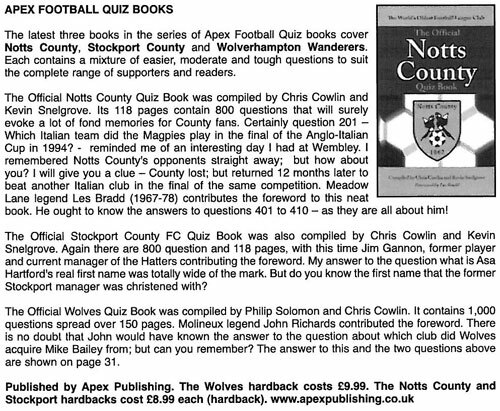 Chris answered questions about his book 'The Official Notts County Quiz Book'. Chris Cowlin and Kevin Snelgrove signed copies of their book 'The Official Notts County Quiz Book' at Waterstone’s, Bridlesmith Gate, Nottingham.